Engineered for increased strength and durability. Environmental Mats are made of superior, tight grain interior Douglas Fir and Oak giving them exceptional strength. They can withstand the rigours of construction and climate conditions anywhere in North America. 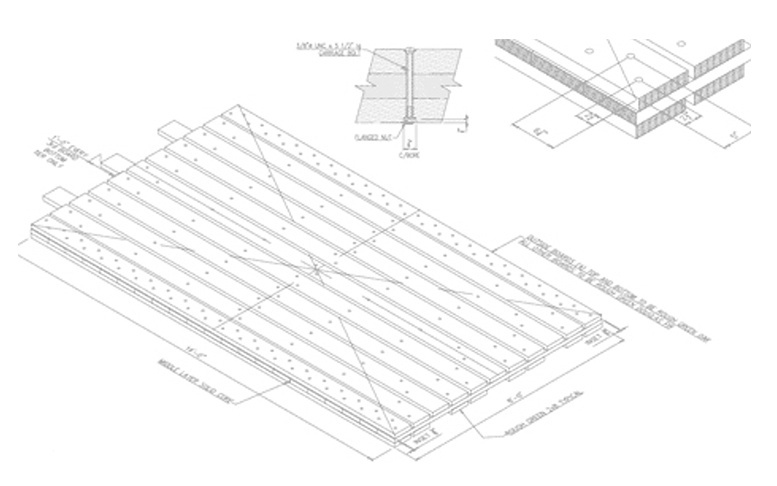 Our engineered mat design has a solid core and offset bolt pattern providing extra strength to ensure the mats perform in all conditions. Fir & Oak Mats 175 21-22 3/8"
Excellent dimensional stability-ability to season well in position without twisting, bending, shrinking and/or expanding. Noted for tough fiber, dense grain structure and strength. High specific gravity providing excellent nail and bolt-holding ability. Documented superior performance against strong forces resulting from use (railways,bridges, etc).